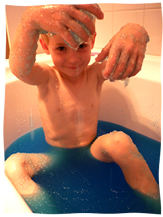 The kids have recently seen an advertisements for a product called Gelli-Baff - which claims to turn your bath water into jelly, then back again when you add a sachet of jelly dissolver. They'd been wanting to try it for a while (who wouldn't!) so when they recently completed a string of good deeds we went up to the supermarket to get some. It actually took us a while to find it as it was in the kids toys aisle (as opposed to bath products) - I recon this is because it's well and truly priced as a gift, not an every day item (like bubble bath). I kid you not but a pack of Gelli-Baff costs $12.56! Of course divided over all the jelly baths you have per pack it brings the cost down per bath considerably. All the way down to 12.56 per bath in fact. Yep - only one bath per pack! And not only that but the product says it will turn 40 litres of water into jelly - which is a regular bath filled up to about 6cm deep. Pretty shallow really - and reeking slightly of false advertising as there's a picture on the cover of the pack of a bath filled with considerably more than 6cm of water. So how did it perform I hear you ask. Well it was ok - the water went jelly-ish and the kids thought it was pretty fun. It was kind of more like consistancy of that glue you do paper mache with than jelly. When we put the stuff in which was supposed to turn the jelly back to water it only really did it a bit. So the kids had to have showers after the bath anyway. Overall it was ok - probably a good present for a birthday party or something like that. My major question though is why the heck did they spell it like that?